Both Barrels - May 2016. Fine and calm conditions greeted many hunters on Opening Day…causing some in places like Otago to reflect that it was about the tenth fine opening in a row! So not unusually, success was mixed. Duck flew high as hunters applied the sun block in many places, and in Nelson-Marlborough some folk reckoned it was the warmest opening ever! In one or two areas like the West Coast, conditions were ideal with fog and low cloud all through the lower river valleys. Yet again, the happy buzz of another hunting season kick off was marred by no fewer than three incidents, including one where a nine year-old boy was shot in the foot. We're sure that all those people involved THOUGHT they were behaving safely. Instead of risking injury through complacency, who not put yourself through a little refresher on firearm safety? The Mountain Safety Council has lots of useful info from safety tips to free downloadable brochures. On a happier note, apart from the odd hot spot, rangers found most hunters complying well with the rules & regulations. And weather-wise, good old southerlies and rain have kicked in since opening, prompting ducks to start flying and putting many hunters in a better mood. The season has weeks left to run – and there are ute-loads of opportunities still out there – with the season for pukeko, black swan pheasant and quail running to August 28 in most areas (see below for more info). Remember that hunters in the big Eastern Region can now take advantage of being able to hunt the 20-odd Crown-owned wetlands around the region administered by Fish Game. 'Walk in' or casual permits are being issued for most of these balloted reserves. They can be obtained by phoning or writing to the Eastern Region Fish & Game office. P.S. This month's cover picture from Jacob Lucas shows Marcus Girvan, Joe Martin and Fonzy. P.P.S - If you think you've got an image worthy of featuring on our 'cover', email it to Don Rood for consideration. Take your own journey to dine on duck! A reminder to take up the opportunity on offer with the Game Bird Food Festival. 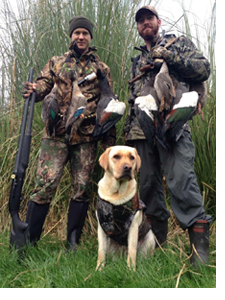 If you're a hunter, here's your chance to whistle up a couple of hunting mates and get birds cooked by a professional. Click here for participating restaurants or recipes if you're a diehard DIY type. Click here for details. We've been at pains to let you know about the additional opportunities on offer this season to get out hunting game birds, after some healthy increases in duck populations. Fish & Game regions which have changed their regulations in your favour include Eastern in the central North Island, Wellington, Nelson / Marlborough and Southland. Study the regs and make a plan! If you've misplaced your regulations booklet, swot up North or south Island regulations here. We've also done our best to assure game bird hunters on the question of access to traditional hunting spots – after lots of swirling rumours and misinformation. If you haven't caught up with our information on the new workplace safety legislation, click here for details. Send in your band details! Remember that duck bands are part of some important Fish & Game research – and we need those details. It's a big team effort by your fellow hunters that falls at the last hurdle if you don't send them in. Phone 0800 BIRD BAND (0800-2473 2263). It's a free-call and works 24/7. And you could go in the draw to win one of five camo' hunting jackets kindly provided by Hunting & Fishing New Zealand. For details, click here. Congratulations to Marcus Wild from Wellington on winning the Duck Hunting NZ duck hunting photo competition, supported by Fish & Game. The colourful photo shows the results of a good opening morning. The contest supported by Canon NZ and Dunedin's The Photo Gallery was held over the last two weeks and attracted over a hundred entries.